Nanbet is a formidable young woman raising five children on her own. She is a farmer and clean energy entrepreneur. For Nanbet, her energy business means she can grow more and feed her children properly. She also loves to see the impact the products have on her community. Nanbet lives with four of her children in a small community in the rolling green hills of Plateau State, famous for the spring water that comes from its volcanic soil. When she became a Solar Sister entrepreneur in late 2016, Nanbet was raising five children after her husband abandoned the family. It was a particularly hard time and she tried everything to get meals on the table every day for her family. Nanbet at her maize farm. Nanbet bought the minimum product inventory required to join up as a Solar Sister entrepreneur, wondering if this opportunity would be any help. 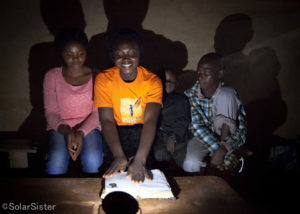 She attended nearby Solar Sister trainings about clean energy and setting up her own business. And thanks to her own initiative and energy, Nanbet started to make sales and bring in extra income. At home she uses one small solar light and cooks on a clean cookstove, which means she’s saving on the cost of kerosene and wood. Her kids are also healthier, no longer breathing toxic fumes from woodsmoke or at risk of burns, eye strain and breathing problems from kerosene lamps. The income stream from Nanbet’s energy business, together with her efforts in other areas, has enabled a modest but significant stability. She uses it to pay for fertilizers and laborers for her farm, which in turn has increased her yield of potatoes, maize and beans. Before my life wasn’t like this. People have since been surprised to see me and my children, with meat on our bones, looking healthy. 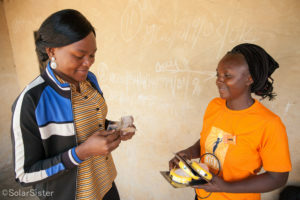 Nanbet now regularly orders solar lights and clean cookstoves from Solar Sister’s Hanatu Onogu, who supports entrepreneurs like Nanbet to kickstart and grow clean energy businesses in rural communities across Plateau State. Hanatu brings the solar lights Nanbet ordered for her customers. Today Nanbet sells mobile solar lights and phone chargers and also clean cookstoves to people in her community without power. She is proud of how these products have an impact on her customers’ lives. It changes people’s lives really, and reduces poverty. Many people tell me that when they buy the product, it reduces costs for them. Joining Solar Sister has also had some unexpected happy side effects for Nanbet. Participating in Sisterhood groups for training, Nanbet met Mercy, a fellow entrepreneur who lives nearby, and they became fast friends. Solar Sister helps me a lot in different corners and angles of my life. It is not just the income. I made friends with Mercy through Solar Sister. Some of the most popular solar products in rural communities are the small, portable lights that are affordable and durable. Learn more about the products our entrepreneurs offer here. Nanbet reads with her children. Nanbet and a happy customer!